MyWay Mobile Storage of Baltimore donated portable storage units to the 22nd Annual MSP Polar Bear Plunge benefiting Special Olympics of Maryland. MyWay Mobile Storage of Baltimore helped thousands of people brave the icy waters of Chesapeake Bay on Saturday, January 27th at the 22nd Annual Polar Bear Plunge, sponsored by the Maryland State Police. 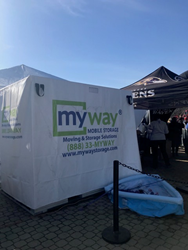 For the ninth consecutive year, MyWay Mobile Storage of Baltimore donated four portable storage containers to the Special Olympics of Maryland (SOMD). Like last year, SOMD has included the following groups to participate in their own unique smaller plunges on the Thursday and Friday prior to the Main Event: The Police Plunge, Cool Schools Plunge, Fire/EMS Plunge, Military and Corporate Plunge. The "Main Event" Plunges took place at 1PM and 3PM on Saturday. After all was said and done from the Plunge weekend the event totaled 10,000 plungers, 22,000 donors, 42 law enforcement agencies, over a hundred corporate partners and hundreds and hundreds of volunteers. Nate Garland, with Special Olympics of Maryland said, "MyWay Mobile Storage has been a loyal partner for our Polar Bear Plunge event over the past eight years. Their portable storage units are extremely helpful and convenient for our on-site storage needs and transporting our supplies and equipment from our office to the event site. Their staff is always super friendly, arrives on time, and is willing to do whatever necessary to meet our needs. The storage units always look nice. We are thankful for MyWay's generosity and their support of Special Olympics events in our community."